Home/Community Volunteering/Get involved in the sport where every kid can go pro! Get involved in the sport where every kid can go pro! FIRST (For the Inspiration and Recognition of Science and Technology) Washington engages youth ages 6-18 in exciting mentor-based programs that build science and technology leaders. Along with 5,500 mentors and event volunteers, we serve 11,500 youth on 1,140 teams across 130 school districts in 33 of Washington’s 39 counties. While this is a powerful statement, it is not enough. With nearly 1.1 million K-12 Washington State students, the opportunity for growth is significant. Over 100,000 students are eligible to graduate each year, and yet Washington State employers are forced to look out of state to fill positions. Washington employers agree that in the next five years, 740,000 jobs in our state need to be filled and they want these jobs filled by locally grown talent. 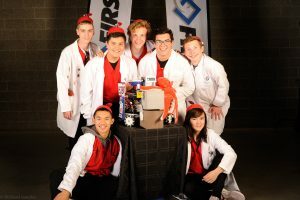 At FIRST, youth can progress through four programs that use project-based learning: FIRST LEGO League Jr. (grades K-4); FIRST LEGO League (grades 4-8); FIRST Tech Challenge (grades 7-12); and FIRST Robotics Competition (grades 9-12). Our programs stand out among other programs in that they immerse youth into a real-world engineering experience, a subculture of STEM that they can’t get in a traditional classroom. Under the leadership of a coach/mentor, youth form teams, meet regularly to solve a challenge, and participate in friendly sports-like competitions throughout the year. Our programs use robotics as the vehicle for students to learn to experiment, deal with failure, research a problem, and learn valuable career, communication, and teamwork skills. Students as young as six apply this learning to design a robot around an annual challenge that is applicable to the real world. 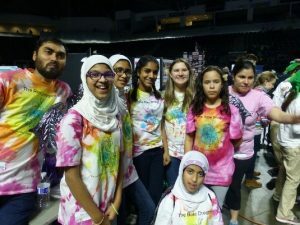 While “robotics” may not be for everyone, kids are immediately drawn to the robot, which means kids from all abilities, economic circumstances, and ethnicities become engaged. The thrill of competition and playing a competitive sport that is built on science, technology and teamwork has the potential to outpace competitive sports such as soccer, football, basketball and lacrosse. FIRST participants are 50 percent more likely to go to college, and twice as likely to major in a STEM field. Roughly 40 percent of FIRST participants come from Title 1 schools, which have a higher percentage of disadvantaged kids. Forty-four percent of our participants are minority youth. Through our Girl’s FIRST Initiative, we have increased the number of girls participating from 28 to 36 percent across all four of our programs. Our goal is to reach 50 percent. Our vision is for every youth in Washington State to have the opportunity to participate in a FIRST program and to serve 22,000 youth by 2022. Take a few minutes to get to know one of our teams, by watching The Nerdy Girls. Help educate state lawmakers about FIRST programs and the impact we are having in building a local workforce. Volunteer with FIRST Washington. There are students who need your time and talent and we promise it will be a rewarding and impactful experience for you as well. Visit www.firstwa.org. All donations to FIRST Washington support teams. Donations may be restricted to a specific team or geographic area while unrestricted donations are allocated to teams with demonstrated need. In our programs, students have the hardest fun of their lives. Together we can close the workforce development gap and ensure that young people are ready for Washington State’s jobs of tomorrow. To get involved with FIRST Washington please visit: www.firstwa.org.